A few quick points regarding the sudden reform push by Iraq prime minister Haydar al-Abadi, representing the first significant constitutional developments during a term so far characterised above all by the war against ISIS. -Proper legal procedure was not followed when the vice presidents were voted out of office by parliament on 11 August: According to the law on presidential deputies, the initiative for relieving them of duty should have gone through the president, not the prime minister. -In accordance with the law on presidential deputies, the Iraqi parliament is in any case under a legal obligation to elect a new presidential deputy within 15 days from the post became vacant. -The Iraqi vice presidential position is a position stipulated and hence protected by the constitution. A cabinet that chooses to ignore this could in theory also send parliament on an indeterminate vacation. Whereas it was a good decision to get rid of two superfluous VP posts that were created only to care for the egos of certain bloc leaders, to abolish the VP position altogether seems distinctly unconstitutional. -Also exactly like in July 2011, no proper constitutional procedure was followed during the downsizing of the cabinet from 33 to 22 ministries. As per the Iraqi constitution, each of the ministers relieved of duty should have been subjected to an individual vote (and discussion) in parliament. Again, the decision in itself is laudable but the procedure that was followed is not. -An interesting aspect of the recent reform measures concern the attack on ethno-sectarian and party quota-sharing arrangements (muhasasa). Such attacks have been part and parcel of political correct rhetoric in Iraq ever since the emergence of new democratic institutions, but only under Abadi’s recent reforms has it been taken seriously – to the point where Kurds, in particular, are worried that it will mean majoritarianism and informal Shia dominance in practice. It should be stressed that this aspect of the reform IS constitutional. Ethno-sectarian proportional representation is only an explicit constitutional requirement as far as the armed forces, the parliament, and a one-off, now defunct, committee for reviewing the constitution are concerned. 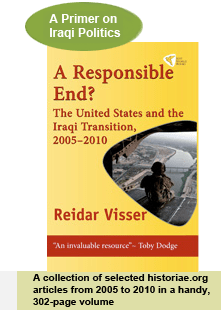 It has nonetheless become a de facto organising principle at almost every level of Iraqi government. -The Iraqi government should be given credit for allowing public protest and persevering with reform, even as it faces an existential external threat in the shape of ISIS. The Kurdish regional government could in this case learn something from Baghdad: External threats are in themselves not an argument for setting democracy to one side. However, if the Iraqi government opts to cheat on legal procedure, its reforms are likely to be stillborn. Not least with respect to the importance of getting the judiciary on board for reform – it is in itself highly in need of an overhaul – it would be wise to stick to instruments and arrangements that are clearly within the constitutional and legal limits. This entry was posted on Tuesday, 18 August 2015 21:50 at 21:50	and is filed under Iraqi constitutional issues, Rule of law. You can follow any responses to this entry through the RSS 2.0 feed. Both comments and pings are currently closed.